Alex Jay, an old friend and author of the excellent Tenth Letter of the Alphabet blog, has sent me a detailed addendum to my post on the terminology of graphic design. “I don’t know if you searched Chronicling America [I did not] but it’s a good source for old newspapers,” he writes. Through it Alex found a reference to “graphic design” as early as 1842 in the New-York Daily Tribune where it refers speciﬁcally to engraving. Similar references appear in the Sunbury American in 1856, the New-York Tribune in 1888 and The Wichita Daily Eagle in 1896. Finally, Alex extracted this information from a Google snippet of the California Teachers Association Journal [The Sierra Educational News] August 1921 (vol. XVII, no. 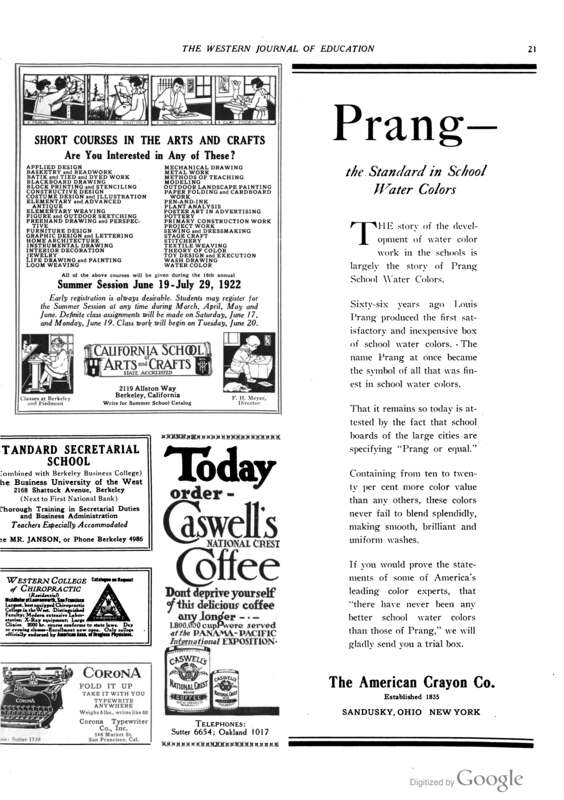 8), p. 535: “The New Year’s card reproduced in color on the back cover page of this Issue is typical of the work done by students in the Graphic Design Class of the California School of Arts and Crafts, Berkeley.” And there is a related reference on p. 552.